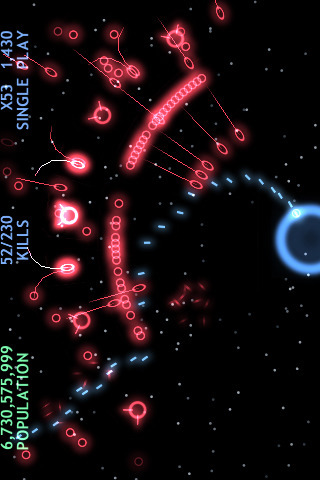 Get Your Space Shooter Accelerometer Fix with Blue Defense! Blue Defense! is an accelerometer controlled protect-your-planet game centered on the principle of a space shooter. Formerly deemed Defend!, this game by John Kooistra is simple and beautifully executed, perfect for moments when you want to kick back and get caught up in saving the planet. When you open Blue Defense! for the first time you’re greeted with neon-type lettering and simple but clean design. Getting a handle on the app is almost intuitive and the actual design of space is successfully executed with simple graphics and everything you’d expect from the color palette of a space game (read black, neon blues and greens, and red). 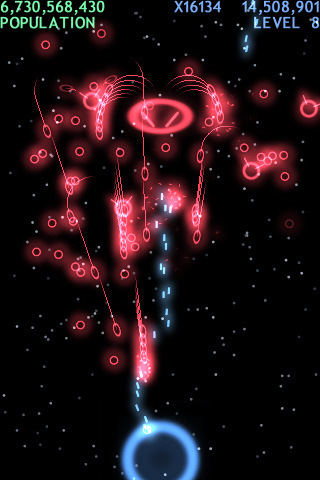 The planet you’re sent out to protect is a blue orb and the invading enemies appear as shapes streaming down at you. 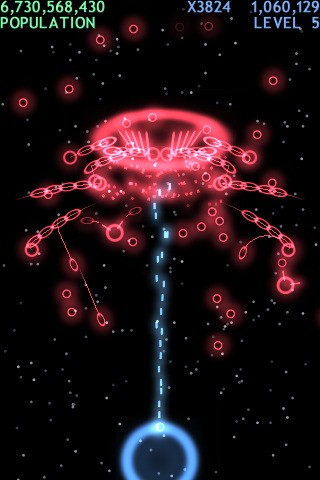 At first the dots are singular forces floating slowly toward you, but as you advance you’re set against forces that give birth to more enemies and lose power via a meter that makes you feel like you’re fighting a boss. Those seeing the game for the first time will go through a tutorial that teaches the principles of shooting at oncoming forces, dividing your fire into two streams, and even firing cannonball-type shots for the purpose of wiping out a wide range of enemies. Learning the gist of the game is simple. You tilt your iPad right to set your stream of shots toward the left and tilt left to shoot right, much like a sailboat rudder. You touch the screen with two fingers to divide your shots, and then do a gathering power catapult type movement to throw thick bombs into space. These must be used wisely though, as the number of cannon shots you are given is limited. Once you’re into the thick of it all you quickly realize that Blue Defense! isn’t organized like most games. The emphasis isn’t so much on beating a series of levels in succession with a certain number of lives. Instead you can play in various modes that include classic (easing yourself into a stream of infinite levels), quick start (a mode that lets you build high scores faster by starting you on a higher difficulty wave), gauntlet (a survival mode against ordered waves), and level select (the mode that lets you go in and tackle specific levels one at a time). If your planet is hit by too many enemy forces you die. If you’re victorious though, you have the opportunity to post your scores online and even win performance based awards. All said and done it’s a fun game with a good feature set, a solid control panel that lets you switch between two soundtrack modes, turn vibrate on and off, and much more. I never got so addicted to the game that I couldn’t do my work, but unlike most apps, I’m almost sure that Blue Defense! is a shooter title I’ll keep on my iPad and refer to consistently throughout the life of my iPad. One of my favorite game features is the fact that you inevitably end up rotating your iPad in a complete circle to defeat the enemies that come from all directions. Plus, the accelerometer controls alone are enough to really show off how amazing the iPad is for gaming. Bottom Line: Easy to learn but difficult to master, Blue Defense! 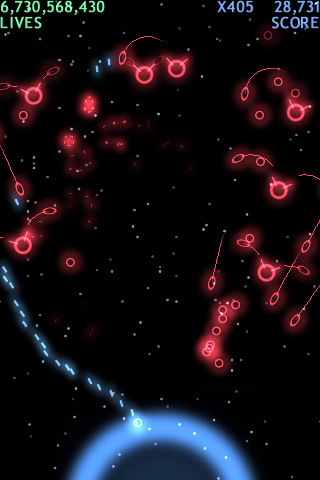 is a well executed save-the-planet space shooter variation.